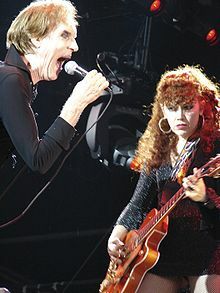 The Cramps are an American garage punk band, formed in 1973. Their line-up rotated much over their existence, with the husband and wife duo of lead singer Lux Interior and lead guitarist Poison Ivy as the only permanent members. They were part of the early CBGB punk movement that had emerged in New York. By being the first known band to blend punk with rockabilly, The Cramps are widely recognized as innovators of psychobilly, as well as garage punk.